US Civil War Antique Maps. World & Hemisphere Antique Maps. 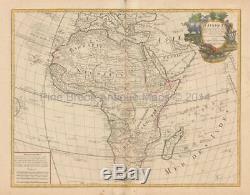 African Continent Antique Map DeLisle 1708. This is an original landmark antique map of Africa. This is the first map of Africa to show Africa without the two Nile River Ptolemaic-based source lakes. DeLisle's last remaining major concession to Ptolemy is with the map's east to west flow of the Niger River into the Atlantic, though the Niger source lake, Lacus Niger in west central Africa, is not presented as on previous maps of Africa. The west to east Nubia River, also shown in previous maps flowing eastward into the Nile, ceases to exist on this map. DeLisle also gives the correct longitude for the Mediterranean Sea of 42°, thus correcting the width of the northern shape of Africa. He was elected a member of the Academie Royale des Sciences in 1702 and then was appointed "Premier geographe du Roi" in 1718. This authentic vintage map of Africa served as the model for European mapmakers and was frequently copied throughout the eighteenth century. DeLisle exercised care, wherever possible, in the inclusion only of verifiable information. The map was constantly being updated; thus there were a number of later states of this map quickly following on his original 1700 First State publication. In this map's state immediately below the title cartouche the following is added: "se Trouve a Amsterdam chez L Renard Libraire Pres de la Bourse". Sometime after 1708 and before 1718+, the copperplate was evidently used by Louis Renard. In this state, the following imprint is lightly etched below the title cartouche: "se Trouve a Amsterdam chez L Renard Libraire Pres de la Bourse". This evidently refers to an agreement to allow Renard the right to sell the map on the Amsterdam market. All maps come with a beautiful Certificate of Authenticity suitable for display with no pricing information (great for gifting). Also, when available, a copy of the title and contents page from the atlas the map came from. Our experience has shown that these large diameter tubes and loose rolling leave no paper memory. Pine Brook Antique Maps is committed to protecting your privacy. We will not sell or disclose any information that identifies you to a third party, Period! We may use the information we collect to periodically notify you about new services or special offers we think you\'ll find valuable. Pine Brook Maps does not sell, trade or rent your personal information to others. The item "Africa Antique Map Original African Decor History Gift Ideas DeLisle 1708" is in sale since Friday, November 16, 2018. This item is in the category "Antiques\Maps, Atlases & Globes\Africa Maps". The seller is "hudsonbay" and is located in Newburgh, NY. This item can be shipped to United States, Canada, United Kingdom, Germany, France, Australia, Denmark, Romania, Slovakia, Bulgaria, Czech republic, Finland, Hungary, Latvia, Lithuania, Malta, Estonia, Greece, Portugal, Cyprus, Slovenia, Japan, China, Sweden, South Korea, Indonesia, Taiwan, South africa, Thailand, Belgium, Hong Kong, Ireland, Netherlands, Poland, Spain, Italy, Austria, Israel, Mexico, New Zealand, Singapore, Switzerland, Norway, Saudi arabia, Ukraine, United arab emirates, Qatar, Kuwait, Bahrain, Croatia, Malaysia, Brazil, Colombia, Costa rica, Panama, Trinidad and tobago, Guatemala, Honduras, Jamaica, Barbados, Bangladesh, Bermuda, Brunei darussalam, Bolivia, Ecuador, Egypt, French guiana, Guernsey, Gibraltar, Guadeloupe, Iceland, Jersey, Jordan, Cambodia, Cayman islands, Liechtenstein, Sri lanka, Luxembourg, Monaco, Macao, Martinique, Maldives, Nicaragua, Oman, Peru, Pakistan, Paraguay, Reunion.